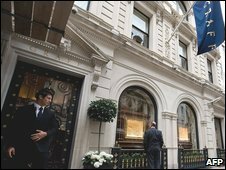 A third man has been charged with taking part in a £40m robbery at a jewellery store in central London. Clinton Mogg, 42, from Westby Road in Bournemouth, has been charged with conspiracy to rob Graff jewellers in New Bond Street on 6 August. He will appear at Westminster Magistrates' Court on Saturday. Two other men, charged with the same offence, appeared before the same court on Friday. They are due to appear at Kingston Crown Court on 1 September. Craig Calderwood, 26, and Solomun Beyene, 24, are accused of "conspiring with others" to rob. There was no application for bail for Mr Calderwood, of no fixed address, or Mr Beyene, of Lilestone Street, St John's Wood, north London. Forty-three items, including rings, bracelets, necklaces, earrings and watches, were stolen in what was the biggest ever jewellery raid in the UK.